When your cookies and baked goods are as good as gold, you need the perfect box to show them off. 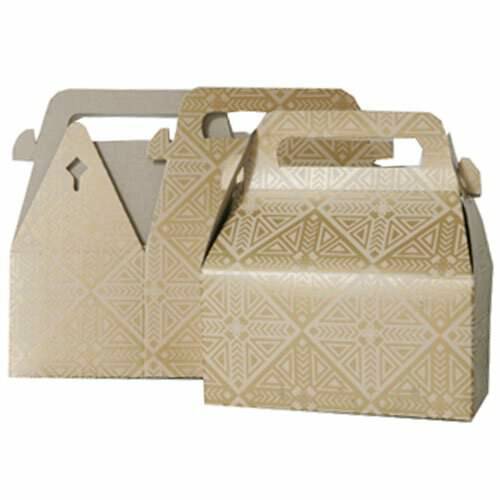 Our festive Small Gold Gable Boxes are perfect as Christmas Cookie Boxes, especially for the countless dinners and parties you get invited to during the holidays. Just toss in some of your famous gingerbread people, sugar cookies, or chocolate fudge, and you’ll be the most popular one at the party. With a gold design in four sophisticated styles, you’ll find the perfect box for every event, so you’ll never show up empty handed again. And since they fold flat, you’ll always have one on hand for your next party. And for weddings, birthday parties, and promotional events, these are even great for wrapping up party favors and company gifts. When you’re a first-rate baker, don’t hide it with a second-rate cookie box. Show off with our Small Gold Gable Boxes. Available in 3 1/4 x 6 x 3. Available in Gold Kraft, Silver Gold Diamond, Purple Gold Diamond, and Red Gold Diamond.